Bornean Orangutans are the largest tree dwelling mammal. They have a body length between 1.1 and 1.4 m (3.5 - 4.5 ft) and they weigh between 40 and 80 kgs (88 - 75 lbs). Their long hair is red/brown in colour and males have large cheek pads that grow bigger as they get older. Males also have long arm hair, a long beard and a moustache. They have exceptionally long arms which enable them to move easily between the trees. 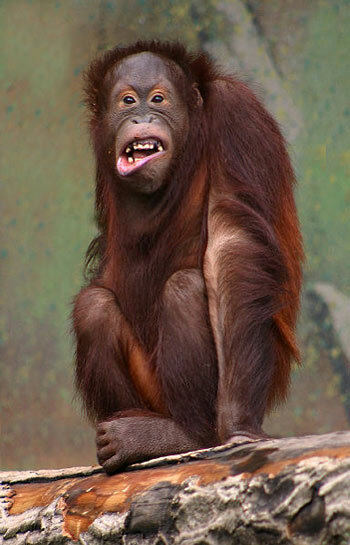 Bornean Orangutans can be found in the rainforests of Borneo, south east Asia. They are tree dwelling animals and only very occasionally will males venture to the ground. They are generally solitary, except mothers with young, but they sometimes meet other orangutans at feeding places. Bornean Orangutans feed on fruits, honey, lizards, termites, birds and eggs. After a gestation period of 244 days, Bornean Orangutans give birth in a tree top nest. The youngster begins to eat solid food at 4 months old and during their first year they cling to their mother as she move through the trees. The mother and her youngster stay together until the young orangutan reaches 8 years old and females will give birth once every 8 years. Humans are the main predators of Bornean Orangutans. 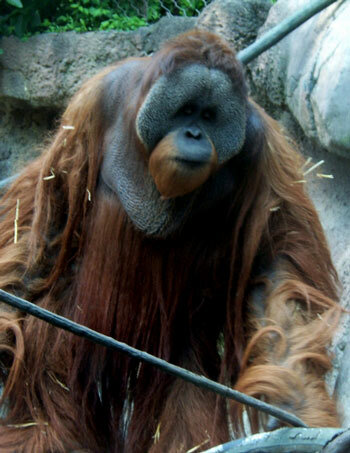 In Malay, Orangutan means "person of the forest"